This value indicates that the content is clipped and that if the user agent uses a scrolling mechanism that is visible on the screen (such as a scroll bar or a panner), that mechanism should be displayed for a box whether or not any of its content is clipped. This avoids any problem with scrollbars appearing and disappearing in a dynamic environment. When this value is specified and the target medium is 'print', overflowing content may be printed. When used on table boxes, this value has the same meaning as 'visible'. The behavior of the 'auto' value is user agent-dependent, but should cause a scrolling mechanism to be provided for overflowing boxes. When used on table boxes, this value has the same meaning as 'visible'. On a table element ('display: table'), 'overflow' applies to the table box (i.e., not the table wrapper box) and all values other than 'hidden' are treated as 'visible'. 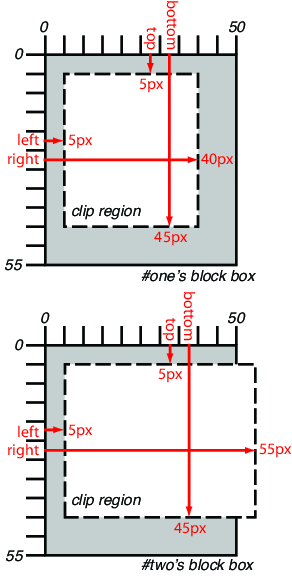 In CSS 2.2, the only valid <shape> value is: rect(<top>, <right>, <bottom>, <left>) where <top> and <bottom> specify offsets from the top border edge of the box, and <right>, and <left> specify offsets from the left border edge of the box. Authors should separate offset values with commas. User agents must support separation with commas, but may also support separation without commas (but not a combination), because a previous revision of this specification was ambiguous in this respect. Note. 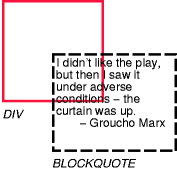 In CSS 2.2, all clipping regions are rectangular. We anticipate future extensions to permit non-rectangular clipping. Future updates may also reintroduce a syntax for offsetting shapes from each edge instead of offsetting from a point.